So you would like to know, what happened to make me a weirdo. Well, I have been writing a book - A book of adventure to find Self. It's actually a children’s story and while I started the first word, I had an odd feeling, I didn’t know what to write because a normal person doesn’t think of all that type of nonsense. But I wanted to write. For me it was breaking the shackles of my being. So then I was really stuck because I literally am not that genius. If I do not know, then what will I write? So I used my weirdo behaviour, I prayed, talking with God thing. I don’t know whether you would believe it, I spoke to God, well speaking in the sense talking to oneself silently in blank space of my mind (if I had to shout believe me, I’ll be in a mental asylum(smile)), feeling that God is somewhere and He will be hearing me and I started doing it regularly in church and on my way, when in work, etc....He heard me. I started getting ideas, it started as a trickle, then started flowing, like a brook, then it turned out to be a river and now it's like a waterfall, shall I say Angel Waterfalls? And I completed my book within a month. 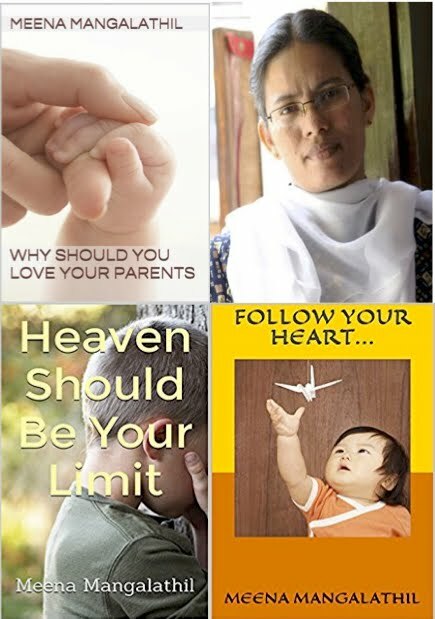 And the name of my book is “Heaven Should Be Your Limit”. You might ask why this name. I think I changed the name thrice and all the three wasn’t right for me, like, whatever we do something should touch the heart. It didn’t touch my heart. So I cut it out and the day to send my manuscript arrived and still I didn’t get a name. I asked, “God, you gave me the contents of the book, then why can’t you give me the name too. If that too is provided, naturally, it would be completely your book and lo behold, 10 minutes before I was preparing to print my manuscript, I got the name, but I didn’t know why that name. It just came out like that. Then I knew, God doesn’t want us to stop half way - the sky because we always use the saying Sky is the limit, now, I think He has set a new boundary . But all these experiences are new to me. Once I heard a college girl saying that she didn’t know anything for the final examination and she felt like crying seeing the question paper. She prayed heart rendingly and then she saw a television screen in front of her (I thought she might be joking) and there were all the answers she asked for. I was thinking at that time, God is helping to cheat? But now, when I started writing this book, I knew, God helps, literally helps, those who are in need and who ask for it. Believe it guys, anything and everything can happen with God. We too do as such and much more, if anyone ask in a very heart ripping way, won’t we? It's a God quality – Love is what is behind it and to learn this simple fact, I do not know, how to say, I really travelled a long way and I’m glad, I did it. I got a lot of answers and it is in this book. Let me be true, it is not my knowledge, that is 100% fact. These things cannot be written with intelligence. It is something above that. I’ll let you peek my book little by little so that you too know, what is inside. But before that the publisher to consent to say yes to my book only then I can say, it would become a book. And anyway, I leave it to Him, who wrote it for me. If He wants you to see, He’ll have to make the publisher say Yes. So until tomorrow, take care.